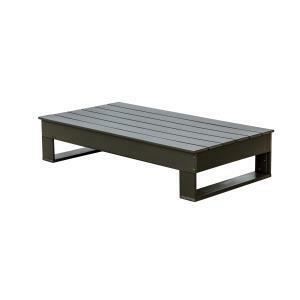 Wildridge Contemporary Deep Seat Coffee Table | ET&T Distributors, Inc.
Poly lumber (PL) is an innovative form of lumber made entirely of virgin or recycled plastic. Ours uses 95% recycled plastics, making it an eco-friendly lumber choice. It is also 100% recyclable after its original use. Exceptionally strong and durable, poly lumber resists cracking, splitting, and weathering, yet remains remarkably lightweight due to its high strength-to-density ratio. Also hailed for its versatility, poly lumber can be produced in countless shapes and colors. American Made - Wildridge Poly Furniture, crafted in Holmes County, home to the largest Amish community in the world, combining old-world artistry with modern day style and sustainability. Eco-Friendly - Ever-growing landfills around the world are packed to the brim with non-biodegradable materials. Plastic bottles alone take at least 450 years to break down! When plastics are not recycled, they may pollute oceans, cities, waterways, and natural ecosystems. Plastic pollution is a serious health hazard for humans and animals, but not one without solutions. Recycling plastics is one way to address environmental degradation, and Wildridge is committed to using poly lumber made from 90% recycled plastics. Innovative Technology - Poly resin has revolutionized the lumber industry. Not only is it kinder to the environment, but it produces a superior furniture product in terms of durability and longevity. Our furniture is made from WILDRIDGE HDPE, a poly lumber with a high strength-to-density ratio. This creates a product that is exceptionally strong yet surprisingly lightweight. Poly furniture also resists rot and mold, and withstands all types of weather. There's simply no better alternative for outdoor furniture that lasts.